We have an electric charge and a magnetic field. Everywhere the charge moves there is one magnetic field line going through it. That line has a direction - the direction of the magnetic field - and the direct surrounding of the charge has a magnetic field line density - the strength of the magnetic field. If the charge moves along a magnetic field line then it does not accelerate or decelerate, nor does it change direction. It feels no force. It moves with constant speed in a straight line - as long as its path lays along the magnetic field line. If the charge moves perpendicular to a magnetic field line then the charge moves in a circle, but its speed doesn’t change. The circle is smaller when the magnetic field line density is larger and thus the field is stronger, but the speed still doesn’t change. At any velocity the electric charge has a velocity component along the magnetic field line through it, and a component perpendicular to that. The component along the line has constant speed and does not change direction. The perpendicular component has constant speed too but moves along a circle. As a consequence the charge moves with constant speed in a spiral around a bundle magnetic field lines, see fig. 12.1. When the lines come closer to each other the field is stronger and the circle the charge traces becomes smaller. When the lines diverge again the circle the charge traces becomes wider again. As if it want to keep a constant number of magnetic field lines enveloped within the circle it traces. When we have a row of charges at same initial speed at the beginning of some path through the magnetic field, their velocity keep constant. They would trace the same path while maintaining constant mutual distance. This is an electric current. Currents run through a conductor. In doing so they can keep electric neutrality, the electric net force being zero. We describe the inside of a BoL here. So far we met two things as conductor: ionized tubes of air, or strings of electricity conducting magnetic dust particles. The dust particles tend to lay itself along magnetic field lines. 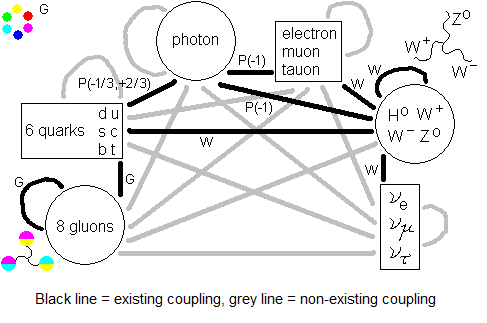 It is a beautiful agent to embody magnetic field lines as electricity conducting wires. But here the particles encircle the magnetic field lines. In the free-floating electric charge example described so far, the only conductor left is the tubes. But it is unlikely tubes laying precisely there where the particles would like to go in their free flight - unless all of the air there is ionized. We can ask the inside to be ionized, however I not directly see how that may come to be yet. Don’t expect high voltages or big current strengths. I more think about a heap of charge appearing somewhere in the BoL, the mutual repulsion pushes them out and they are launched into the magnetic field. There the charges in fact are free floating. Provided identical launch speed and direction, they would follow identical path through the magnetic field. They form a current. In fig. 12.2 we see currents spiraling around the circular magnetic field lines of the circlecurrent. The part in the black oval resembles fig 12.1. The spiral currents have their own magnetic field B. When the spiral currents are strong enough (consisting of enough particles) then small amounts of charged new particles can spiral around the bundles of magnetic field B. They form a current too. And so on. This is the fractal BoL. These are free floating currents through ionized air encircling bundles of magnetic field lines. Now another approach. 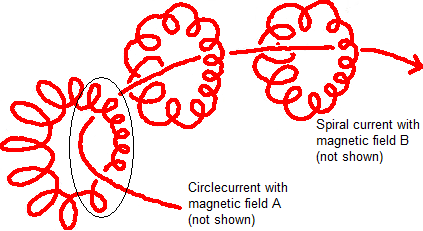 Imagine the circle of the circlecurrent consists of conducting magnetic dust. Thereafter some of the lines of the circlecurrent´s magnetic field becomes embodied by magnetic dust too. After a while there are coherent and complete circles of magnetic dust around the circlecurrent. By induction these circles soon conduct electric current. This current has a magnetic field too. The lines of this new field soon are embodied by magnetic dust, soon thereafter conducting electricity. Around which a still smaller magnetic field forms - and so on. This is a fractal BoL too. As far as I can see, these two kinds of fractal BoL I described so far, are the same. The described tubes-one coincides completely with parts of the described magnetic dust BoL. It are the same currents running, or nearly the same currents. Most probably it is of minor importance whether the currents are running through a pile of circles or through one single spiral in stead of the pile. That resembles each other; with a little friction a stack of circles can change itself into one spiral (or two - or more? - intertwined spirals). A fractaled BoL, substantially embodied by magnetic dust, may look like a metal solid body, round and structured like a craft, a flying saucer or UFO. Not too much dust of course, for the BoL would crash under its own weight. Mark in this picture so far we used the magnetic fields solely to strengthen the wires the dust forms. The acting fields in space are delivered then solely by the currents running through them. The earthcurrents invading the air vertically, do not trace vertical magnetic field lines - such lines are not there. Therefore the vertical columns of the earthcurrents are not embodied magnetic dust. So it is expected the forces of the currents running through wires of magnetic dust in the BoL do not counteract each other too much. In fact, the charges would have traced the same paths anyway when free floating through the ionized air. Fractal BoL’s might be stable. Through the hart of every BoL runs an earthcurrent. A pulsed earthcurrent. We have to add the effect of the earthcurrent’s magnetic field on the currents in the fractal BoL. This really is something for an simulation program. Fractal BoL’s - quite something to be! The Earth orbits the sun. Only the center C of the Earth moves with proper velocity for the orbit around the sun. 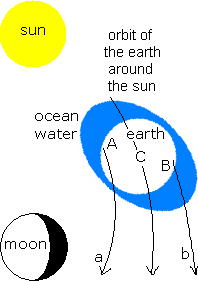 There are two crests of water, A and B (the tides). The velocity v1 of crest A due to the rotation of the Earth around its axis, is subtracted from the velocity v2 of A around the sun. Therefore A moves too slow to maintain proper orbit and starts to fall to the sun. This causes crest A. For crest B velocities v1 + v2 add. Crest B then moves too fast in its orbit around the sun and the ocean water there starts to fly off like a car in a bend that flews of the road. This causes crest B. Also the Moon causes two crests E and F (not shown) but these crests originate from a different mechanism. The Earth and the Moon orbit each other - although the orbit of the Earth around the Moon lies entirely within the Earth. Nevertheless, only the center of the Earth is weightless in its small orbit around the Moon. The front side of the Earth is a little nearer to the Moon, the Moon's gravity is a little stronger there and that causes crest E. The rear side of the Earth is further away from the Moon, the Moon's gravity is a little weaker there and centrifugal force causes crest F there. Likewise the rock in the Earth crust is a tiny little bit pressed, deformed and shoved back and forth in a daily cycle, 4 times a day, changing direction every 6 hours (tidal kneading of the Earth crust). The black line is an old crack. There has been vertical displacement along the crack. Light brown is by example limestone, dark brown another kind of rock. The dotted line is how the sharp edge shown here has smoothed in the course of time to form the kind of landscape you see now in Wiltshire, England. Where the same kind of rock meet, electricity displacement from a to b will equal that from b to a. Everywhere different kind of rock meet, we expect pressure, friction and temperature difference to cause an asymmetric charge displacement. Like a part of the black line in the figure. Especially underground streams, continuous flows with no ways aside to discharge, will collect and conduct charge from rock molded by the tides (piëzo electricity) to the location of the earthcurrents and feed them there. This then must be the source of the earthcurrents.